This knife is perfect for any camper or survivalist. 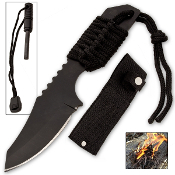 A 7" survival knife with black paracord wrapped around the handle for use in an emergency and a 3" surgical steel black non-reflective blade. The included nylon case holds the fire starter. Just slice the knife onto the fire-starter and watch the sparks fly...literally.